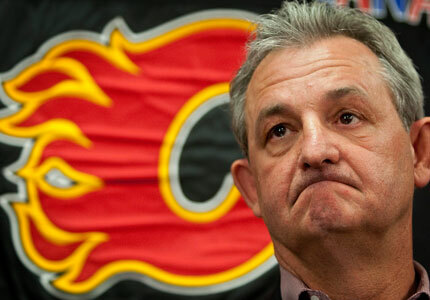 A move that should have taken place a year or two ago, Calgary Flames GM Darryl Sutter is stepping down as the team's GM, to be replaced by Jay Feaster. The changes comes amid a horrible season for the Flames who sit near the bottom of the division, conference, and league standings. Unlike their provincial rival, the Flames are not re-building, as they have an older team that is bumping right up against the NHL's salary cap. Re-acquisitions Olli Jokinen and Alex Tanguay have not panned out - much like many expected - and that combined with the Flames position in the standings likely sent Sutter packing. Indeed, since a Stanley Cup Finals appearance in 2004, the Flames have been ousted in the first round of the playoffs for a few years after, only to miss the playoffs altogether last year. The team has been in decline for years and this action is probably long overdue for many in the 'Sea of Red'. When you look at some of Sutter's moves over the past few years, you wonder why this move did not come sooner. The decision to trade for Olli Jokinen originally seemed like a decent plan to obtain a front line center for team captain Jarome Iginla. That off-season however may have been the beginning of the end. Calgary chose to keep Olli Jokinen and let Mike Cammalleri leave for Montreal - a move that in hindsight definitely appears to have backfired, as Cammalleri has flourished in Montreal while Jokinen sputtered. To compound matters, the Flames traded Jokinen along with Brandon Prust for Chris Higgins and Ales Kotalik. Higgins left in the off-season and Kotalik was placed on waivers. So for the original first round pick that was traded for Jokinen, the Flames lost Mike Cammalleri, Brandon Prust, Chris Higgins and Ales Kotalik. Even with the re-acquisition of Olli Jokinen in the off-season, that string of decisions appears to have been an unmitigated disaster. In Sutter's defense, his acquisition of Miikka Kiprusoff provided some goaltending that the Flames hadn't seen since the Mike Vernon days, and he likely can't be criticized for the Jay Bouwmeester signing, as few could have predicted his struggles. Regardless of the analysis of his individual decisions, and the numerous coaches he's used over the years (himself, Jim Playfair, himself, Mike Keenan, himself, Harvey the Hound, himself, Brent Sutter), Darryl's legacy will likely be spelled out over the coming year or two. At this point, he can be remembered for reviving hockey in southern Alberta with a strong run in 2004. Beyond that, some poor salary cap management and poor personnel decisions did the team no favours. There may be a long rebuild in Calgary that begins this year or next, and it will be at that time when we can determine how big of a hole Darryl Sutter has dug the Calgary Flames. For more information on the Flames struggles, Sportsnet's Mark Spector shared his thoughts a mere 10 days ago.